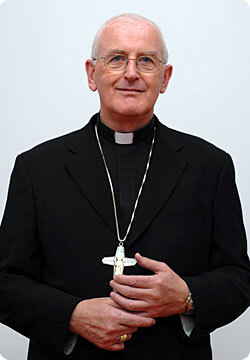 Right Reverend Thomas Matthew Burns, SM, BA, BD (born 3 June 1944) is a British Roman Catholic Bishop. On 16 October 2008 he was appointed as Bishop of Menevia by Pope Benedict XVI. 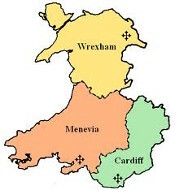 He was installed as The 11th Bishop of Menevia, at the Cathedral Church of Saint Joseph Swansea on 1st December 2008. I am writing to congratulate you on the continuing and growing success of the Peace Mala Organisation, a marvellous achievement which I support and wholeheartedly endorse. The work of Peace Mala, which I have as Bishop been able to personally witness here in Menevia, its 'birthplace', is entirely consistent with the Christian ideals and the teachings of the Catholic Church, which acknowledge in all faiths a power of good and truth when sincere followers of the diverse religions which enrich humanity strive to work together for a world of justice, compassion, understanding and lasting peace. Your work in support of human rights, and against all forms of intolerance and prejudice, reflect the dignity of every human person made in God's image, and called on a journey of faith and love towards him, and in fellowship with the earth and with each other. Continuing the precious legacy of Blessed John Paul II, Pope Benedict, surrounded by representatives of all faiths and none in Assisi just a few weeks ago, declared: "The God in whom we Christians believe is the Creator and Father of all, and from him all people are brothers and sisters and form one single family ... In the name of God, that every religion bring justice and peace, forgiveness and life and love to the world!" This has been the aim and message of Peace Mala from the beginning, and the work you have done in promoting it here and elsewhere has been and continues to be invaluable, and an example of courage and commitment to us all. As Christians we do believe that the different 'colours' of the prism which represent the various faiths on your (now rather famous!) Peace Mala bracelet do 'come together' in the Light that is Christ, the fulfillment of all truth, Light of the World and 'Prince of Peace'. May his blessing of Peace and Joy be with you and all those who share in your work. Thomas Matthew Burns was born in Belfast, but his family later moved to Lancashire. After studying at St. Mary's College, Blackburn, a sixth form in an Exeter school, and a monastery in Paignton, Burns was ordained to the priesthood on 16 December 1971, for the Society of Mary. He then did pastoral work, taught economics in Sidcup and Blackburn, and served as a chaplain in the Royal Navy. In 1986 he was commissioned as a full-time Chaplain in the Royal Navy. After training at HMS Raleigh and Britannia Royal Naval College he served as a Chaplain in HMS Drake and at Devonport Naval Base. From there he went to sea with the ships of the first Flotilla (to the Falklands, the Gulf and the Caribbean), and then joined the Chaplaincy Team in Britannia Royal Naval College Dartmouth. On leaving the Navy in 1992, he took up an appointment as Bursar General at the Marist Fathers' Headquarters in Rome but subsequently rejoined the Royal Navy in January 1994. His first appointment was again to sea, for a period of 18 months, when he joined the staff of the Initial Sea Training Department in the newly created post of Chaplain to the Ships embarking Officer Cadets for their first experience of sea-going life. After completing the Initial Staff Course at Greenwich Royal Naval College, he proceeded to Portsmouth, where he headed an ecumenical team working in HMS Nelson and the Naval Base. 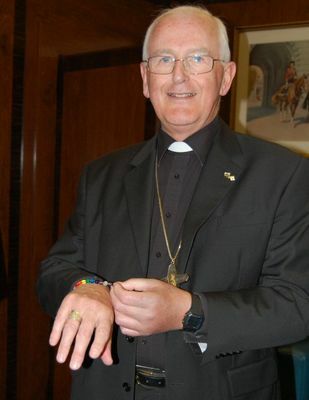 On 24 May 2002, he was appointed to head the military ordinariate of Great Britain, the Bishopric of the Forces. He received his episcopal consecration on the following 18 June from Cardinal Cormac Murphy-O'Connor, with Bishop Francis Walmsley and Archbishop Patrick Altham Kelly serving as co-consecrators. To see the original letter we received from Bishop Tom Burns click here.